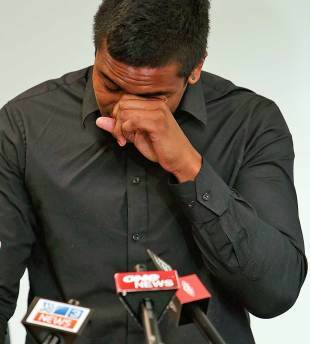 Hurricanes and All Blacks winger Julian Savea has been remanded on bail after appearing in Wellington District Court facing one charge of assault following a domestic incident last Sunday. Savea made no comment to media during his appearance, having fronted a press conference on Sunday when he apologised for his actions. "My partner and I had an argument, I did some things that are wrong, that I shouldn't have done," Savea said. "To my partner and her family, I just want to say that I'm sorry. To have someone that you love and care so much for, to be in this situation, I know it's hurting them and it's definitely hurting me, so I apologise to them." Hurricanes chief executive James Te Puni said on Sunday: "Obviously, we are disappointed to have this situation emerge, but we must now let the judicial process run its course. The key thing for us is to support the families as they work through what is a very difficult time. I have spoken with Julian who is deeply upset to be in this position and now needs to deal with the situation." New Zealand Rugby chief executive Steve Tew said: "We were very disappointed to learn of this incident and Julian's subsequent charge. We appreciate this is a distressing time for all those affected and we are also helping support the family. As his employer, we want to ensure that our process regarding misconduct proceedings also respects his right to a fair hearing in court, so we will await the conclusion of the court process. "Without judging the rights or wrongs of this case, we are concerned that this is another incident involving a young player. We need to find out whether we are doing enough to help these young men cope with the pressures of the professional game. As a result of these various incidents, we will be undertaking an independent assessment of the support we provide players from their time of induction into the professional game." Te Puni said Savea had also appeared on posters in 2012 as part of the "It's Not OK" campaign against family violence. "Given that, Julian is embarrassed and apologetic he now finds himself in this situation," Te Puni said. The nine-Test All Black will re-appear in the Wellington District Court on May 15.